In 2018 Michael completed his first novel - a romance entitled "Fine Again". Since its publication, Michael has written several dark fantasy novels. Most notably, the novel "Defiled", book one of series, "The Castle Chronicles". Michael has two children and three grandchildren, and currently lives on Cleveland's West Side with his wife, Angie. In his spare time, he enjoys reading, traveling, and attending as many concerts as possible. Defiled is a delightfully creepy work of young adult fantasy and horror, penned by author Michael S. Vassel. Written as the opening book to the Castle Chronicles, we meet the series’s hero Mark Castle when he is just a high school student. Mark has had powers from farther back than he can remember, honing his strange abilities with the hope that one day he’ll put them to good use. So when he dreams of a young woman who wants him to find her, Mark sets about asking his school friends to help him contact the world of the dead. They meet their would-be spirit guide, and the adventure is just beginning from there. Irreverent, spooky and very, very fun, Defiled by Michael S. Vassel is certain to be enjoyed by all lovers of playful macabre fantasy tales, mysteries and spine-tingling stories. It reminded me of R. L. Stine’s Goosebumps series a lot during reading, with its seemingly average hero revealing strange gifts and quite unsettling powers as the novel goes on. The plot around Mark and his discoveries is well constructed to believably convey the adventures of him and his high school friends, and the experimentation with magic and the Netherworld is represented sensitively, to be taken with a pinch of salt. Overall, Defiled marks a fantastic start to what promises to be a really exciting and enjoyable young adult series, and I would highly recommend it to all fans of pop horror and slightly more grown up Scooby Doo mystery fun. For almost as long as he can remember, Mark Castle has suffered from a strange dream. A desperate plea for help is carried to his ears in slumber. A single message, an urgent request, 'Help me, Mark. Find me, please.' It started when he was younger, but as he grows older he realizes there is something different about him, and his closest friends. It turns out they have a gift, and using it is the first step to answering the desperate plea for help. With the help of a rare book or two, Mark delves deeper into the world of magic, and with the help of a spirit guide he soon discovers the unique fate of the girl, and how to help her. But doubts play on his mind and a single warning echoes, don't trust him. Can Mark save the girl who has called to him for so long, or is there something greater afoot, something far more dangerous than simply braving the depths of Hell? Michael S. Vassel's Defiled is a gripping and interesting young adult fantasy with some great characters. Written in an engaging first-person narrative, you can't help but be drawn into the plot. As we cover a large span of Mark's life, from childhood to adolescence, there is some time hopping as the character ages, and a few non-linear plot insertions, but they are handed flawlessly and all serve to add intrigue to the plot as you wonder what occurred between young Mark and the older version. I specifically enjoyed how the narrative matures with him. Mystery, intrigue, and magic combine to create a well-paced and fun read that will entertain from the first page to the last. Michael S. Vassel’s Defiled chronicles the quest of modern-day teen epic hero Mark Castle on his journey to Hell and back in an effort to free the soul of a captive young woman from a misguided Sumerian god. This is a first-rate fantasy adventure for young readers. In Mark Castle, Vassel has created an adolescent anti-hero perfectly in step with the interests of 21st-century young adult readers. The backdrop of occult practices and mythology will appeal to even the most reluctant readers. Vassel’s pace is brisk, his characters are fresh and clearly drawn, and the plot comes with enough twists to satisfy even the most hard-to-please fantasy fan. Unlike the whitewashed and diluted teen heroes of many of the young adult fantasy series currently available, Defiled's Mark Castle lives, thinks, and talks like an authentic adolescent – he uses expletives freely, actively seeks out ways to break rules and test boundaries, is riddled with nascent sexual tension, and generally embodies the epitome of a good-hearted youngster being catapulted into a world a bit too quick and wide for him to fully comprehend. 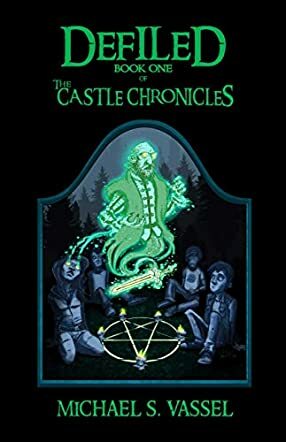 Young readers will no doubt see themselves in Mark Castle and his band of buddies, and the camaraderie of the coven will appeal to teens who are curious about life outside of the mainstream. Vassel has a keen ear for dialogue and an artist’s eye for description, the result being a tale that envelops the reader in the story and makes Defiled hard to put down. The occult lens adds depth and dimension to the drama while presenting both the excitement and the dangers of occult powers in the hands of those not yet qualified to fully understand them. Michael S. Vassel's Defiled casts a spell that will enchant readers of all ages.